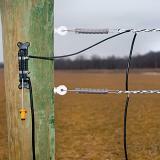 Used for stopping the flow of electricity from one fence to another. 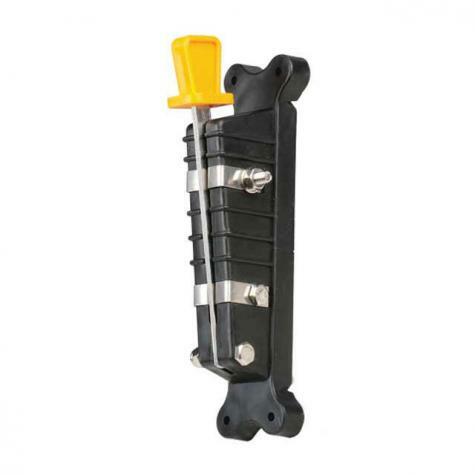 Reliable single-throw design that has never failed Premier or our customers. Easy-to-see when the lever is up (ON) or down (OFF). 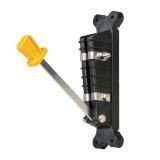 Attach with screws or nails (not included) to a location where the lever can be switched up and down. It's best to mount switch with yellow handle of lever on top. The switch is "on" when the lever is up. 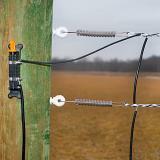 Use insulated wire designed for high voltage to run from power source to the lower of the 2 contact terminals. 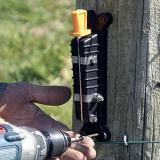 Use another piece of insulated wire to run from top contact terminals to the fence. Make sure energizer is off when installing. Recommended: 15 out of 15 said they would recommend this product to a friend. Very well made with excellent materials. Should stand up to years of use and weather. Much better quality than Tractor Supply which broke when securing wire to switch. These could be even better if built just a bit more rugged. Bought a switch at local tractor supply and it broke the first time we used it. This is way better quality and works wonderful. More economical and better quality than the switches available at our local Tractor Supply. Got a switch from Tractor Supply and it did not survive the installation so I ordered one of these and it is working fine.